Since getting busy in January, starting my projects as an Island Batik Ambassador in February, going on vacation in March, working on a mountain of secret sewing in April, I haven't done a WIP progress and goals post. Whoops! So I'll go through and do a quick update on my WIPs. 1. 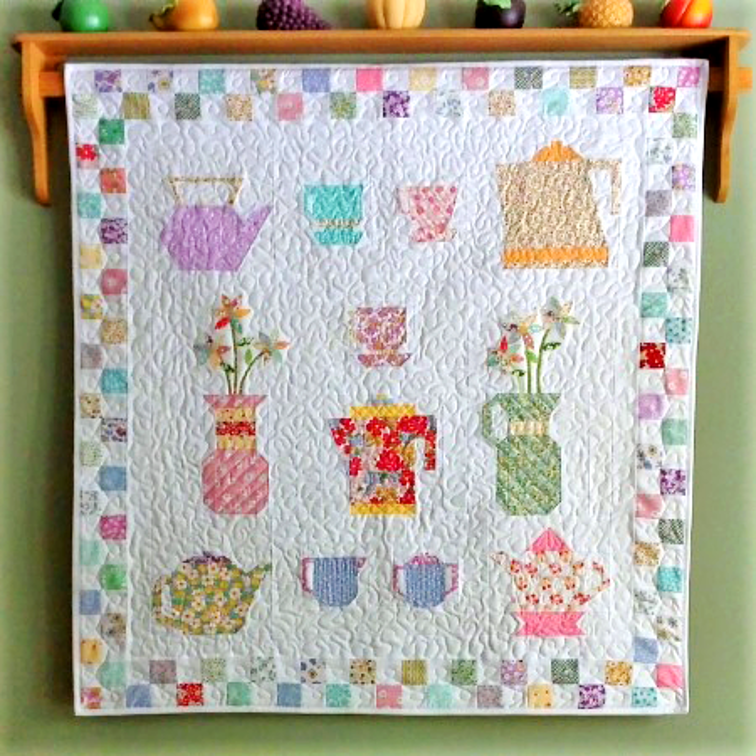 Farmer's Wife Quilt (RSC 2016 project) -- I decided that this is a good size as is and I bought a backing for it. I need to decide if I want to quilt it myself or have it sent out for quilting. 2. Traveling Quilt Bee (2016) -- I need to add more blocks to this quilt. 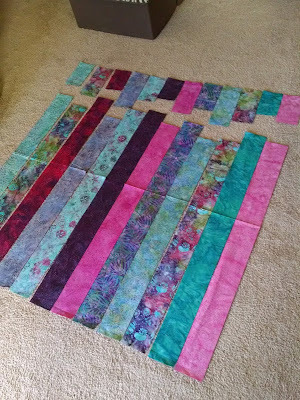 I don't know if I want to do this myself or pass it along to my mom/sister/other quilty friends. 3. 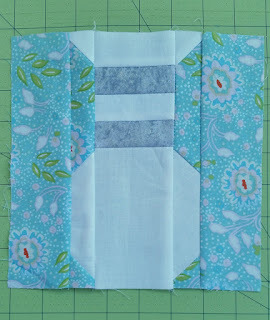 Coast to Coast Bee -- I am currently figuring out what to add to Karen's quilt. She requested blocks in black, white, and teal and I will need to buy some white with black prints. 4. Stash Bee Star quilt -- This one still no additional progress. It is partially quilted and just waiting to be worked on. 5. Top Spin leaders and enders -- I am still working on this as a leader and ender project but I haven't been in as good of a habit of using leaders and enders with as much paper piecing I have done lately. 6. Meadow Mystery QAL -- I have completed this quilt top (hooray) and need to buy backing and batting to quilt this one. 7. Pineapple Stash Bee Blocks -- I haven't touched this since I got the blocks over a year ago. My plan is to ask for more blocks in June when I am queen bee. 8. Summer on the Coast Quilt -- This top is complete, I need to buy backing fabric and batting to quilt it. 9. Monthly Wall Hangings -- I haven't touched this. 10. Allison Glass Sampler Quilt - I bought the backing fabric for this project and am figuring out how I want to quilt it. 14. Happy Houses blocks - Made blocks in January, February, and March as my Rainbow Scrap Challenge blocks. 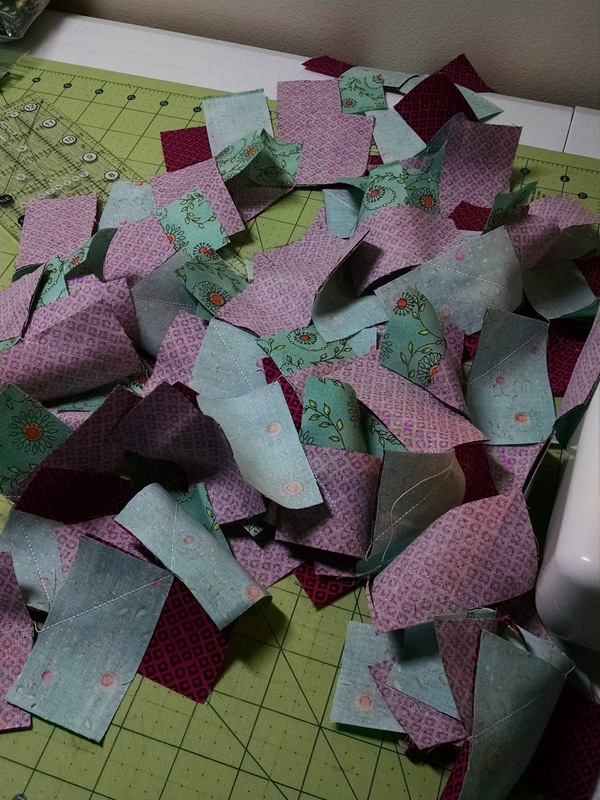 I cut a bunch of fabric for blocks to make in April, only to realize I need to buy sky blue fabric to be able to make more blocks. 1. 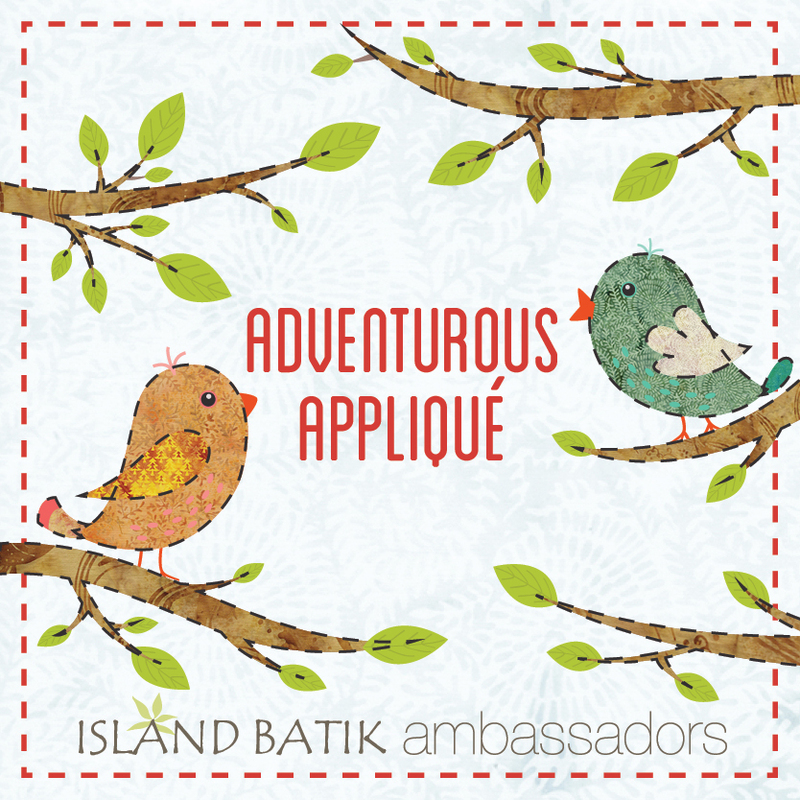 Ongoing various Island Batik Ambassador projects -- My February, March, and April projects are completed and posted. I haven't started my May project yet. 2. 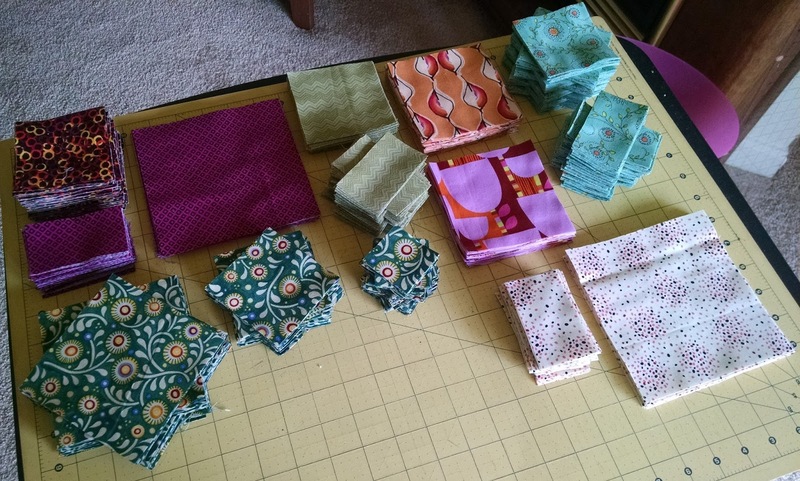 Gathering Mystery Quilt with Cora's Quilts -- I am about two weeks behind on this QAL, but I'm not forcing myself to keep up weekly with all of the other commitments that I have. This is my current "fun" project. 3. Christine's Kitchen QAL -- In progress, I am actually only about a week ahead of the QAL schedule since I did not write this pattern myself. 4. 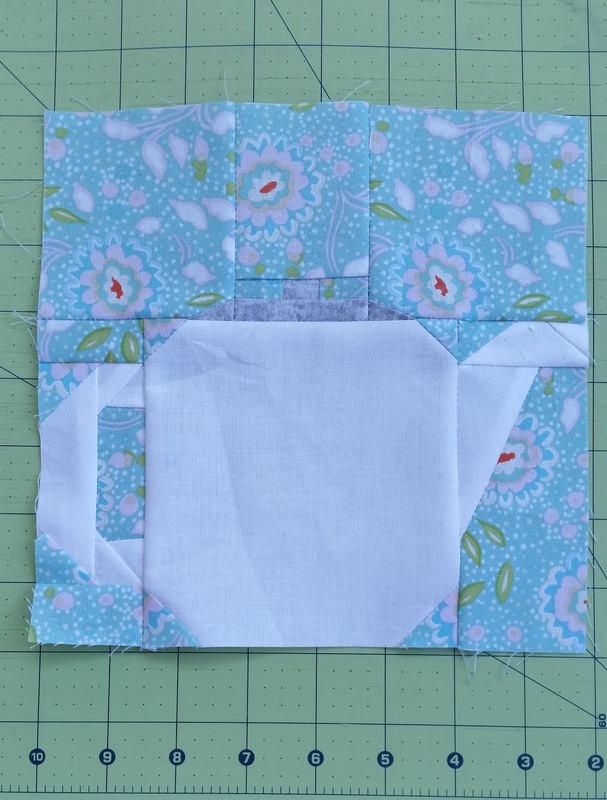 May project for Moda Bake Shop -- I'm currently building the blocks and will hopefully get the quilting started this weekend. This is my current priority project. So clearly I haven't done that well in cutting down my number of WIPs over the last three months but being an Island Batik Ambassador and working on additional projects for MBS and Benartex has taken up a lot of my time. All of these projects are things that *have* to be done in May so this list isn't negotiable, but it is totally reasonable given that most of these are on the smaller side other than my Moda Bake Shop project. That should give me enough time to make progress on a few of my WIP projects as well. Anyone else taking one step forward and two steps back with their WIPs and UFOs? 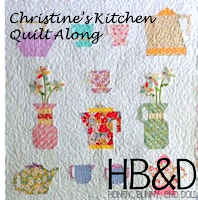 Welcome to Week 6 of the Christine's Kitchen QAL! Update: The QAL Is now over and the entire pattern is now available for purchase. This week we're making our sugar bowl and creamer! Two small blocks this week and next week we'll be making our last paper pieced block! Let's make our blocks! I made both of these blocks at the same time with the same color scheme so they are a matching set! Only one more paper pieced block to go! Don't forget to be ready to applique in two weeks -- if you're planning to use fusible web for your applique, make sure to pick up some this week! 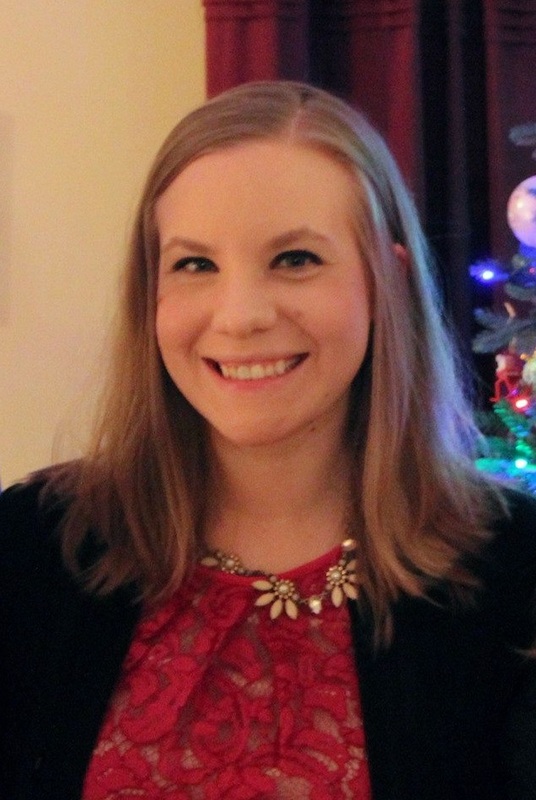 Sharing this week at Let's Bee Social! 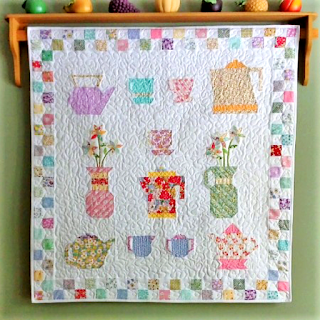 Welcome to Week 5 of the Christine's Kitchen QAL! This week we are making block #8 and block #9 and then joining together blocks #6, #7, and #8 (remember we made #6 and #7 last week!) to make Row #3. 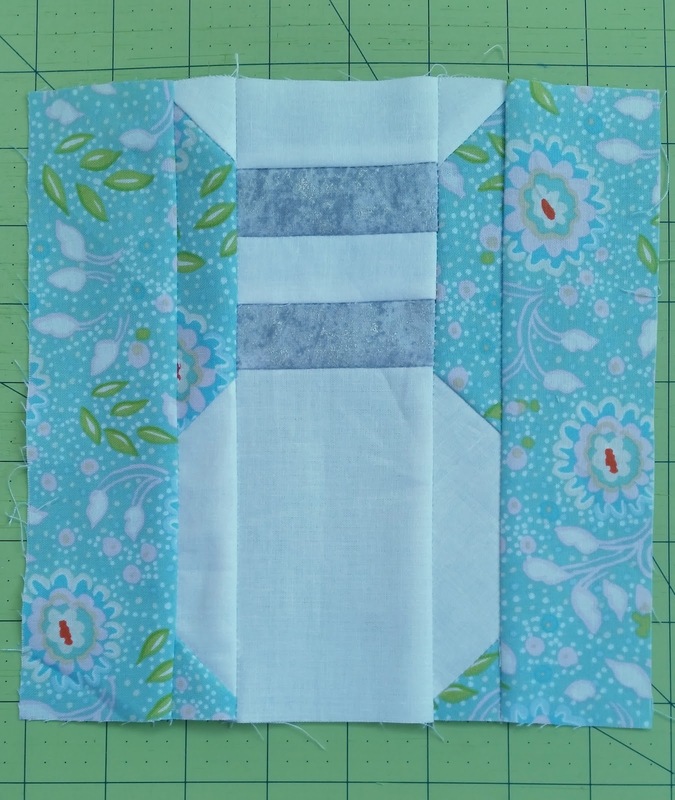 Note: we will not be putting together Row #2 until near the end when we make our applique flower blocks. For tips today, I thought that I would talk about the controversial topic of removing your paper foundations. Some prefer to not remove paper from foundations until an entire quilt top is completed. This does eliminate some distortion worries but it does add extra bulk (and not to mention stiffness) to a quilt top. You would also have to remove all of the paper at the end. Some like to remove paper once a block is completed. 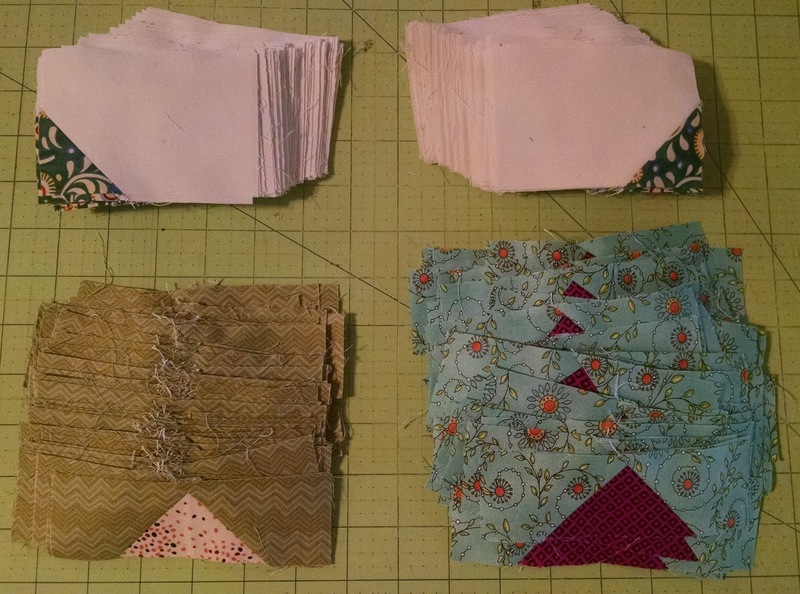 You would still end up sewing through some paper sections but once your block is completed it would be removed. I personally like to remove paper as I go to put my sections together. I don't like sewing through paper any more than I have to and sometimes just the sections themselves are thick enough. 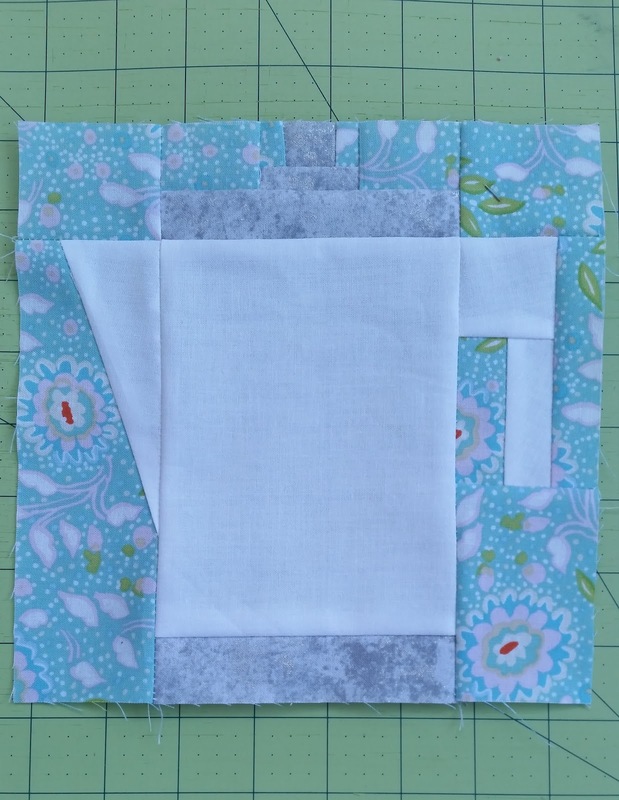 Shortening your stitch length and folding your paper on the sew lines while you trim will help "loosen" the paper and make it easier to tear along the stitch lines. When you remove your paper sections, remove them in the opposite order in which you sewed the pieces -- ie, 4, 3, 2, 1. Be aware of what sections have bias along the edges and be careful to not pull and distort the pieces. I find that it is helpful to hold onto the seam allowances (because it is thicker and more stable) with one hand while I tear with the other. I made block #8 and #9 on separate days so my progress pictures are separate. 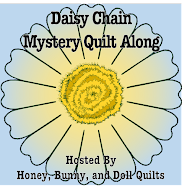 This week is a PRIZE WEEK so post your finished Row #3 on Instagram with #christineskitchenquilt or email me a finished picture at littlebunnyquilts@gmail.com to be entered to win two Honey, Bunny, and Doll patterns of your choosing! We've just released our *brand new* Seasonal Tablerunner patterns that coordinate with our Seasonal Placemats! Today, I'm so excited to share my FINISHED Mystical Mermaid quilt with you, as part of Island Batik's April theme of Adventurous Applique. For the machine applique, I used Superior Threads' Fantastico in Duchess 5079 (a purple and blue variegated thread -- not an affiliate link) in a small blanket stitch around my mermaid. I will say that this is the most detailed machine applique project I have done to date -- I have done quite a bit of machine applique in other projects but I really had to slow down and adjust my piece more frequently than in the past due to all of the detail in the mermaid. I think a smaller stitch length helped maintain the level of detail, but it did take much more time. The result is beautiful, so I will say it was time well invested! For the backing I used a batik from my stash that is mainly navy with rainbow accents. 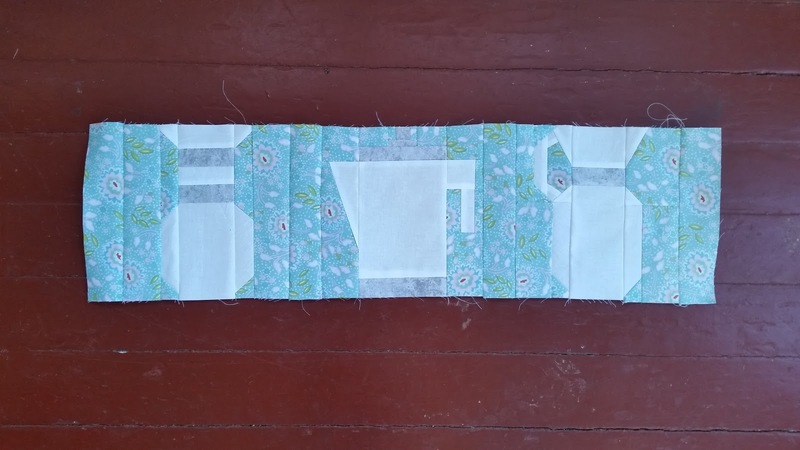 I quilted this all in one day -- the off-white section is a bubble meander, and the stripe sections are a clamshell, or really, mermaid tail scales! 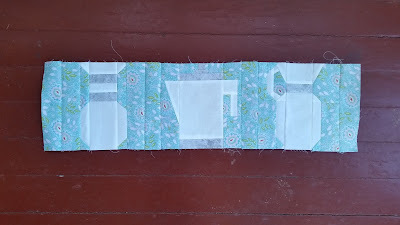 For the quilting, I did the off white section first, and then did the clamshell quilting from that section to each end. I bound this with the same navy + rainbow batik as the backing and finished up the binding this week! Hello, Ariel! 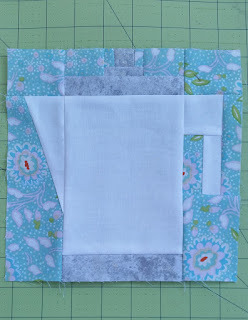 This picture shows off both the clamshell quilting (which is far from perfect) and the backing. The backing is a little more "rainbow" than the main fabrics of the quilt, but the mainly dark backing is what I wanted for this quilt. Another close up of my clamshell quilting -- I used the strip seams as my guides and marked lines perpendicular to keep my clams a consistent height. This is the first time I get to show off a big finish since we've moved and the weather has gotten nice, so I got to explore some new quilt photography locations! This is right outside of our bedroom window. I didn't do any quilting inside of the mermaid and did all of the rest of my quilting in white. You can see the meander quite well in this picture! Sharing at Finish It Up Friday and Free Motion Mavericks! Because I am a crazy person and can't resist joining in new quilt alongs, I have started working on another quilt as part of the Gathering Mystery QAL hosted by Shelly at Cora's Quilts. I've actually watched from the sidelines for both of her previous mystery quilts and finally decided to jump in myself. Before we moved, I pulled the fabrics for this project from my stash -- entirely from my stash other than the background fabric -- wahoo! This color scheme is completely different than the example color scheme, but I did actually follow her suggestions for which fabrics were light/medium/dark other than one fabric. 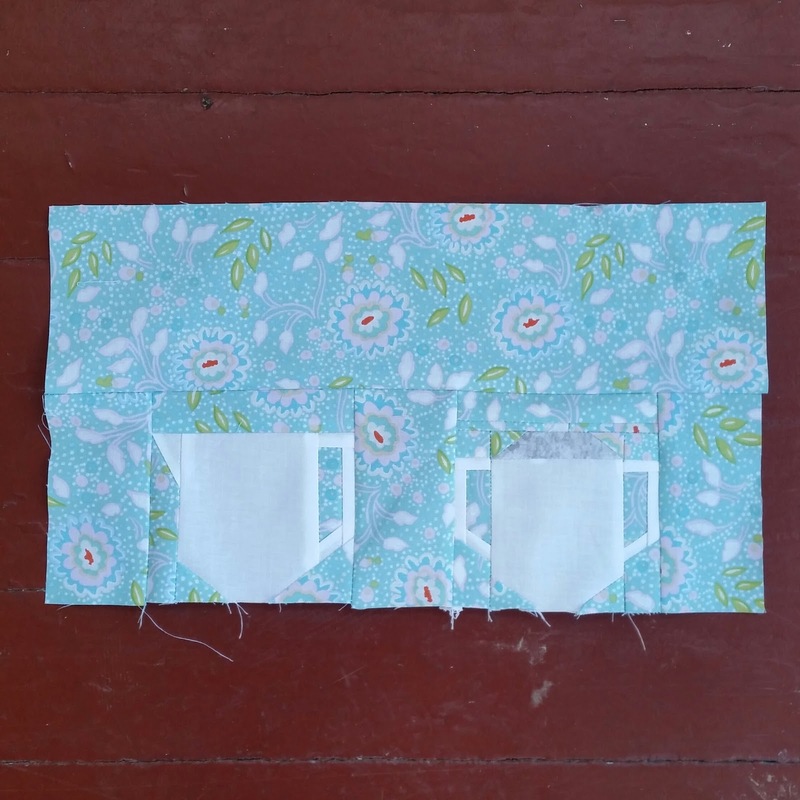 When the cutting directions came out, I decided to swap the fabrics I had chosen for #3 and #4 because I didn't want to chop up my beautiful day lily print up any smaller than was necessary! 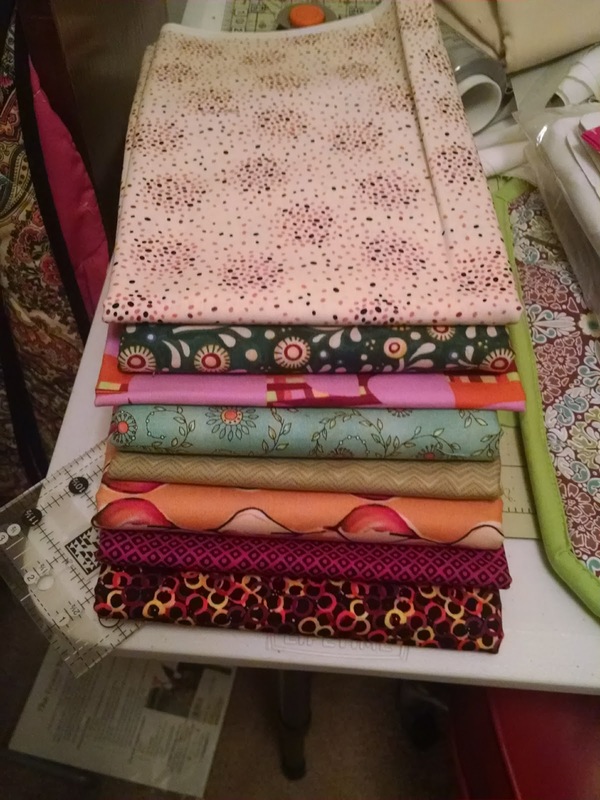 I will still likely use that fabric for the binding (because I don't have enough left of my green ziggy print). Our week #2 sewing assignment was to make a lot of stitch and flip rectangle units using our background fabric and fabric #7 (my dark teal floral). I spent a whole baseball game drawing diagonal lines on my small squares for stitch and flip corners. Our week #3 assignment was to make two different "flying geese-ish" units using a stitch and flip method. After a few that were a little wonky, I actually zipped through these without having to redo too many! Needless to say I have done a LOT of chain piecing over the last week. Here's the first two weeks of units, the top row is Units 1a and 1b, and the bottom row is Units 2a and 2b. 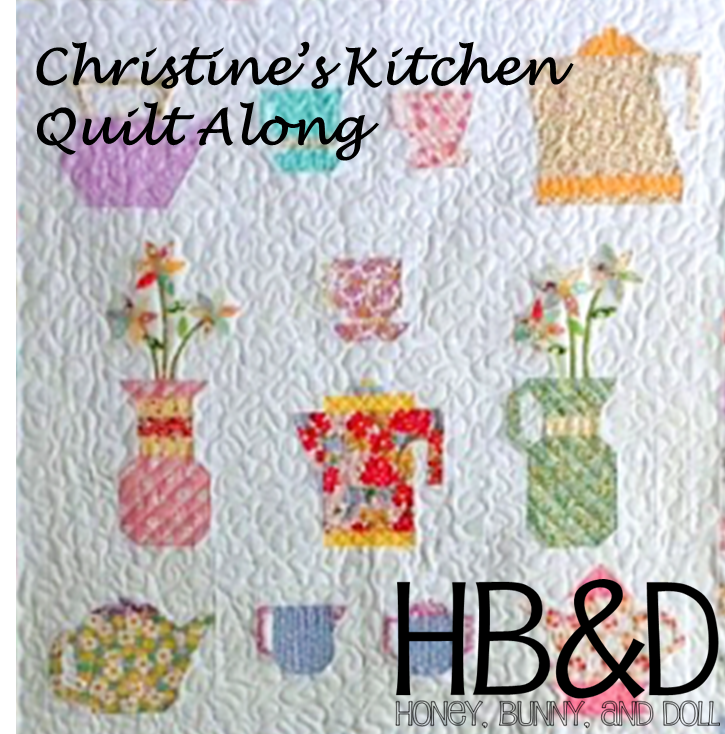 We're back with Week 4 of the Christine's Kitchen QAL! This week we are making the coffee pot and vase in Row #3. Next week, we'll be putting row three together! Back to lots of tips this week! Let's talk about stitching and working with paper. Don't forget to adjust those stitch lengths! If you have any sort of digital machine that probably means you'll need to set your stitch length each time you turn on your machine. Save an old needle for paper piecing -- stitching through paper will dull your needle quickly, so a a slightly dull needle will still do the trick. Save those new needles! Speaking of dullness, cutting through paper will also dull your rotary blades. I trim my units to size with my rotary cutter rather than using my scissors -- it is cheaper to replace rotary blades than to sharpen my scissors and I find the rotary cutter to be much more accurate. You can also save a slightly dull rotary blade to use for paper cutting -- just make sure it isn't dull enough that it becomes dangerous. On to this week's blocks -- here are my block sections -- lots of easy piecing this week! With only a few sections per block, these come together quickly! Next week we will make the pitcher from Row #3 and put Row #3 together with sashing, so that means next week is another prize week! Just thinking about joining? There's still plenty of time to join in on the fun! We're working on lining up the next giveaway prize so stay tuned! 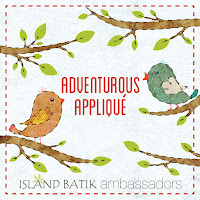 For April, our Island Batik Ambassador theme is Adventurous Applique! I'm very excited to be sharing all about the my applique project. I shared the beginnings of this project all the way back at the beginning of March! This week I'll be sharing all about sewing the top and preparing my applique. Next week I'll be sharing about machine applique and quilting this project. I used the base of our Ready, Set, Soar! pattern as my starting point and pulled some fabrics that had an "under the sea" feel. These fabrics came from the 5 inch x WOF strips included in my goodie box. I cut them to 3.5 inches as the pattern directs and saved the 1.5 inch cutoffs for a future project. And what might the perfect thing to add to a under the sea color scheme? A mermaid of course! I found mermaid clip art online, and enlarged it to my chosen size (approximately 8 inches tall and 24 inches long). I printed it out in banner format (so that I could tape multiple pieces of paper together) and traced the design onto my fusible web. Normally I try to conserve my fusible web as well as limit how much fabric I sacrifice in the process, but with the detail of this piece, it was easier to give myself a little bit of extra wiggle room as I ironed the fusible to my navy solid and cut out my applique shape. I highly recommend using small snip scissors for this process! Hello, Ariel! Isn't she beautiful? To finish up for today, here's the lovely lady ironed on to the quilt top base. Next week on Friday, I'll be sharing about my machine applique process for this quilt as well as quilting and finishing!